This Skinny Slow Cooker Crustless Pumpkin Pie doesn’t lack in flavor, and has the same texture as your standard pumpkin pie. I got rid of the crust, the yolks and used a stevia sweetener instead of sugar (I used Pyure Organic Stevia I got from International Food Blogger Conference). And I topped the pie with fat-free Reddi Whip whipped cream. Now I can have pumpkin pie more than twice a year! And during the holidays I can save oven space! I worked in a pie shop for years. Pumpkin pie was the one of the most ordered. If you haven’t tried pumpkin pie warm with whipped cream or ice cream you are missing out! It’s like a warm pumpkin pudding. 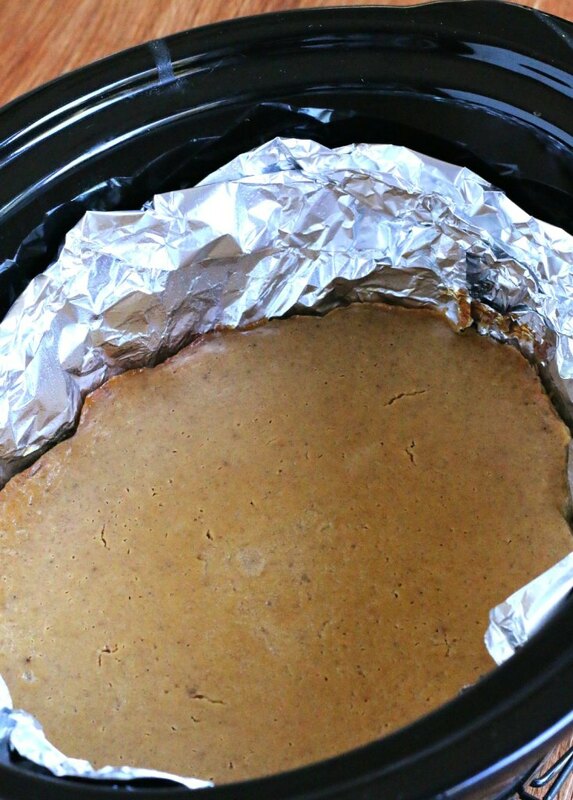 This Slow Cooker Crustless Pumpkin Pie is also good cold if you want to make it ahead. It was fun making a holiday treat this early, my house smelled amazing with the pumpkin spice aroma. I lined my crock pot with foil, then spray the foil with non-stick spray. This worked like a charm for getting the pie out of the crock, and there was no sticking! Line a 6-quart oval slow cooker with foil, I use 2 pieces, each going in different directions. Whisk the pumpkin, evaporated milk, egg whites, stevia, cinnamon, salt, nutmeg, ground cloves, and ginger in a large bowl. Make sure to completely combine. 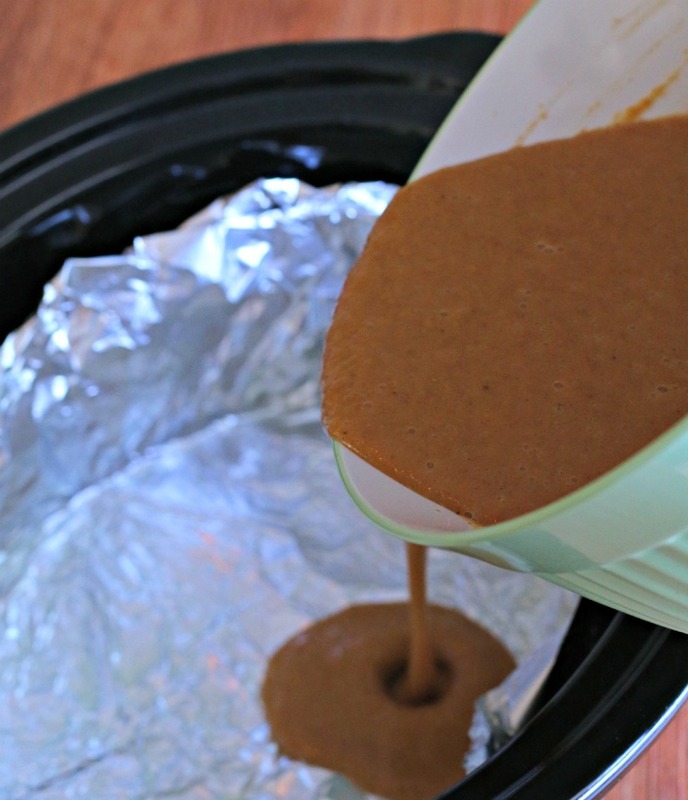 Pour the pumpkin mixture into the prepared slow cooker. Cover, and cook on HIGH for 2.5 hours, I knew mine was done when the center no longer looked soupy and it started to puff slightly around the edges. Take the entire ceramic insert out of the slow cooker, and place on a cooling rack for 30 minutes. Then remove the pie from the slow cooker by grabbing the edges of the foil. Place the foiled pie onto a cooling rack. Let set up for 20 minutes more, serve warm, or refrigerate for later serving. Oh wow. I’ve made crustless pumpkin pie, but never in the slow cooker. What a great idea! Love it! This is exactly how I like my pumpkin pie… crustless! Sounds delicious and easy! this is just about one of the tastiest looking things I have seen in a while! I LOVE this Sarah – looks so silky smooth! Love the tip about lining the crock pot with foil. This looks amazing! I am SO making this one. I love the filling way more than the crust. As a matter of fact, I’ve been known to just eat the filling and leave the crust… this is a perfect and less costly solution! I definitely have to try this! I am a crazy person who isn’t a huge fan of pie crust, so this is perfect for me. Thanks for sharing! You are a genius with the slow cooker, Sarah! Pumpkin pie is my favorite, I can see why it would be the most ordered pie. 🙂 This looks really delicious! Love this version of a pumpkin pie. Easy, crustless, and delicious! I’m going to have to try it. What a great idea and I would have never thought of it! I love pumpkin! I love anything pumpkin and have made crustless pumpkin pie, but never in the crock pot! What a great idea. I’ve recently started using Stevia too so I will be giving this recipe a try. Thank you for sharing it! Hi. I have a 5 quart oval crock pot instead of a 6 quart, and was wondering if I could still make this by maybe letting it cook a little longer? And if so, about how much longer? This looks so good! Hi Sarah, I know this is an older post but I just found it! This pie sounds delicious & I was just wondering if you used stevia powder, liquid, or blend? Thanks so much! I used stevia that was like sugar crystals. I hope that helps!